Welcome to the Math Salamanders' Math Puzzles printable resource pages. Here you will find a range of different math puzzle worksheets, math riddles and challenges to help you learn to apply your math facts to solve a range of puzzles and problems. There are links to a wide range of puzzles including: number fill-in puzzles, number search puzzles, magic square puzzles, money and time puzzles. Looking for some interesting and fun worksheets to try? Do you need some math puzzles or math riddles to solve? Look no further! The pages you need are below! Using puzzles is a great way to check understanding and challenge learning. The puzzles below will test children's learning in different sorts of context, developing problem solving and thinking skills along the way. 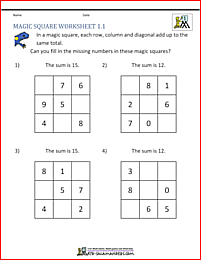 Here is our selection of math puzzles printable sheets from kindergarten to 5th grade. Using puzzles is a much more fun way of exploring the world of math! Here you will find a range of math puzzles aimed at first grade level. Each puzzle sheet has been carefully designed to help children understand some of the basic math concepts at this level. All the fun math worksheets in this section support Elementary math benchmarks for first grade. Here are our second grade math puzzles. Each sheet has been carefully designed to support children of a 2nd grade level understand some of the basic concepts at this level. Develop problem solving and reasoning skills. 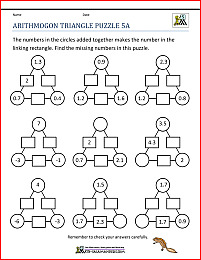 All the math puzzles printable worksheets in this section support Elementary math benchmarks. 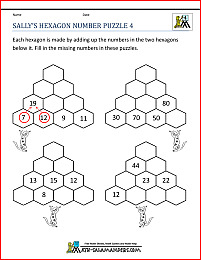 Here are a range of math puzzles for 3rd graders. These sheets have been designed to consolidate, extend and support 3rd grade children in their understanding of addition, subtraction and multiplication. Here is our set of 4th grade math puzzles. Each sheet has been carefully designed to support children of a 4th grade level understand some of the basic concepts, and also to extend and challenge their learning. Each puzzle sheet comes complete with answers. Using the puzzles in this section will help your child develop their problem solving and reasoning skills. Here you will find our selection of free 5th grade printable math puzzles. Each sheet has been developed to support and extend learning at a 5th grade level. Concepts covered include adding decimals, negative numbers, multiplication and division facts (including decimals). 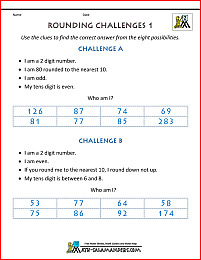 All the math puzzles printable sheets in this section support Elementary math benchmarks for 5th grade. It's great when kids have fun and are learning math skills without really thinking about it. These number fill in puzzles are a great way to develop thinking skills and getting kids to check all the possibilities. The following puzzles involve using place value and rounding skills to find the correct answer from a choice of 6 or 8 possible solutions. The following riddles involve using a series of clues to find the correct answer from a selection of 6 or 8 different numbers. The riddles cover place value up to 10,000 as well as square numbers, palindromes, odd and even numbers and decimals. Using puzzles is a great way to get children to learn about money in a fun and interesting way, and apply their counting money knowledge. Using these 1st Grade money riddles will help your child to develop their money skills and their problem solving skills at the same time. There are a range of sheets suitable for a range of abilities within 1st grade. Using the link below will take you to the 2nd-grade-math-salamanders.com site. These math puzzles printable sheets involve solving money problems and are a great way for kids to develop their reasoning skills and practice their counting money at the same time. These math puzzles printable time sheets will help to get your child thinking about time and solving problems involving time. All the riddles consist of 3 or 4 clues and a selection of 6 or 8 possible answers. Children have to read the clues and work out which is the correct answer. The puzzles can also be used as a template for the children to write their own clues for a partner to guess. Here you will find a range of fun math riddles that will entertain and occupy your child. Each riddle is a mathematical problem that will hopefully prove both stimulating and interesting. Using riddles is a really good way to explore mathematical ideas and concepts in a fun way! There are riddle pages available for both numbers and geometry. solve problems and use their reasoning skills.